As I type, I breathe in the sweet aroma of the hyacinth blooming wickedly early in its pot on the edge of my desk. I put it there to remind me that winter is not capable of eternally putting its grip on me, that there is a light at the end of all this bundling up and hiding in our clothes to stay warm and soon, we too will have an opportunity to blossom and affect those around us with our own influence, just as the purple perfume of the hyacinth teases me now. Mindfulness is not something that the hyacinth has to concern itself about but it is indeed necessary if we are to do the important work of evolving. Flowers merely have to exist and that is enough, and there is something Zenlike to be learned from that, but we humans are here for more complicated tasks and as we function on many levels in an automatic fashion, we must consider our fate, our future and the implications of our actions upon our lives and that of others. 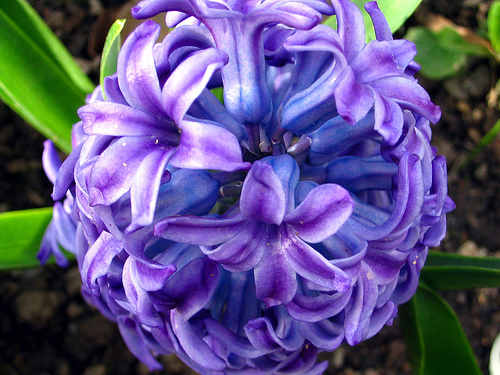 When I am dealing with issues around my infernal weight gain, I wish I could be happy as a plump hyacinth in the field that cares not whether it is trim or not, but alas, being human, I have to own up to it and take responsibility for my actions. I HAVEN’T been fair to myself, I HAVEN’T been good to my physical body, I HAVE neglected to be mindful when it comes to my personal health. It has been at my expense that I have spent the past 22 years taking care of others and that is thankfully changing. In my effort to evolve as a person taking up the space I was intended to, rather than my and two other people’s share, I have spent the past week being mindful of many things I usually let flow by the wayside. Premier in my attentiveness has been watching the labels of what I purchase to use as food for my home. I can see immediate responses as my body already reflects the lack of HFCS I used to flood my poor liver with. Not only do I sleep more soundly, I am noticing that I am much less stiff when moving from a sedentary position, that my back doesn’t ache when I walk like it used to, and that I am limber enough to put on my own socks!!! It’s a bloomin’ miracle! Being mindful to me also means setting ones intentions to live with integrity, to attend to needs in sustainable ways, to care for others but not at the expense of myself. So here we are, facing the end of the second week of 2009. How have you altered your course to live more intentionally? Is your competence approaching unconsciousness yet? Mine hasn’t but I feel like I’m well on my way. As January streaks by, I take time to ponder what I expect of the year. Last year I accomplished much in the way of moving mountains, but this year is going to be even more magical, methinks. In the meantime, I am taking time to get my trajectory on a path that will lead me to being happier inside and out. My last blog article mentioned Time Management, and I wanted to talk about that a wee bit today as I found that the zen of preparing my veggies for the week is going to be a crucial step towards my finding that balance. As I acquired my groceries for the week, in the outside aisles of the supermarket were where I shopped, I took home a plethora of veggies and instead of mindlessly tossing them into the veggie cooler in the fridge, I laid them out to wash. 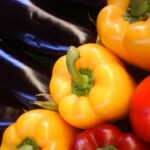 The organic peppers, carrots, broccoli and cauliflower were a colourful delight on my cutting board and I found myself daydreaming about the future as I took care to prepare all the veggies I brought home, in one fell swoop. The rainbow of peppers, and all the other veggies were chopped into small pieces or spears and placed in containers that I stacked in the fridge. It took me an hour to cut them all, but the prep is done now, nothing left but the glory of devouring the delicious little morsels. Not only that, but as I prepare my subsequent meals, its lovely to be able to reach into those prepared veggie containers and grab a handful of this and that to add to the curry or whatever I’m creating. As I cut for that hour, I was mindful of my home’s sanctity, of the peace within, of the happiness and innocence of my kittens, and of how fortunate I am to be in a place in my life where there is so much harmony. I set my sights then, on attaining everything I need for the year, and of course, part of that is to slim down naturally, without denying myself overly much, WITHOUT dieting. In a way, its as if an hour’s blessing has infused these veggies with the sweet peace I need to bravely face all the new adventures coming down the road at me. Timeliness… mindfulness… its all part and parcel of developing that nebulous competence muscle that I’m learning to get much better at utilizing. Can Unconscious competence be far off? Now, every day before I bound off to whatever endeavour I am party to, I stuff a little tupperware container with about three cups of fresh chopped veggies into my voluminous handbag or backpack. Instead of caving to the cravings that the old Tina (Chris) used to give in to, I have an abundance of tastes all ready to placate myself with, where I don’t feel denied and I don’t feel like I’ve drugged myself with the horrible effects of fast food and wannabe sugar snacks. I’m feeling better already! So, tell me, what is your ponderance when it comes to mindfulness?